REOTEMP – REOTEMP Instrument Corporation was established in 1965 and is located in San Diego, California. 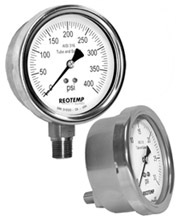 REOTEMP is recognized as a leading manufacturer of temperature and pressure instrumentation. We provide bimetal thermometers, pressure gauges, diaphragm seals, transmitters, RTD’s & thermocouples, pressure transmitters, compost thermometers, and related accessories to a variety of process markets worldwide. REOTEMP is an ISO 9001:2000 certified manufacturer. We are dedicated to continual improvement, on-time deliveries, high quality products, and exceptional customer satisfaction.